Based on the true story of unlikely boxing champion Micky Ward, The Fighter is an enjoyable celebration of family ties and irrepressible spirits. Brothers Micky Ward (Mark Wahlberg) and Dicky Eklund (Christian Bale) are both boxers from the working-class Massachusetts town of Lowell. Older brother Dicky is long past his prime, but remains a local legend for having once fought and knocked-down Sugar Ray Leonard, although it was more of a Leonard stumble. Dicky now pretends to train Micky for upcoming bouts arranged by their overbearing manager mother Alice (Melissa Leo), but Dicky is really just an addict, spending most of his time at the local crackhouse while Micky's career stalls. After Micky is pummeled in a mis-match that he is pushed into by Dicky and Alice, he questions the ability of his family to properly guide his career. He develops a romantic relationship with local bartender Charlene (Amy Adams), and she encourages him to distance himself from his brother, mother and his numerous ugly sisters. Dicky lands in jail after a run-in with the police, but uses the opportunity to break his addiction. With Charlene's support and new management, Micky's career takes a turn for the better, winning several bouts as he starts getting closer to a shot at a world title. Dicky, now clean, is released from prison and has to find a way to reconnect with his brother without jeopardizing his one chance at career success. 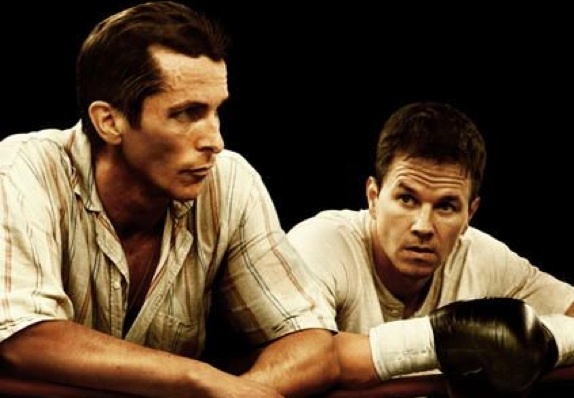 While Mark Wahlberg is relatively subdued as Micky Ward, playing the family meal ticket and black sheep not quite fitting in with his brash surroundings, Christian Bale delivers a remarkable performance as Dicky Eklund. Bale's shifty, restless, yet charming portrayal as the drug-addicted Dicky, living in the past and building his entire life's legend on a single moment that he barely contributed to, is mesmerizing. Dicky discovering his true calling and contributing to his brother's success is the heart of the movie, and director David O. Russell lands an emotionally devastating knock-out punch when the brothers enter the hostile arena for the climatic bout, Dicky leading Micky in softly signing, only to themselves,Whitesnake's Here I Go Again. It's a moment of quiet movie magic. Amy Adams as the trigger for Micky leaving the nest and Melissa Leo as the domineering matriarch of the family both give memorable performances, filled with passion, pride, and mastery of every button that women push when struggling to gain or maintain control. The Fighter does not flinch from portraying life in the lower classes of depressed industrial towns, and the societal bleakness is an obvious reason for the lure of boxing as an escape to a better paycheque. Russell's cameras find excellent drama both on the streets and in the boxing ring, and The Fighter scores a victory in both arenas.